[UCLA Students] Hillary Smith, Bryan West, Jennifer Li, Christopher Ahn cellos. Stories We Tell was commissioned by the Concord Community Music School for their 1998 Anniversary Weekend. Students are in their early teens and get lessons and coaching from the schools instructors. 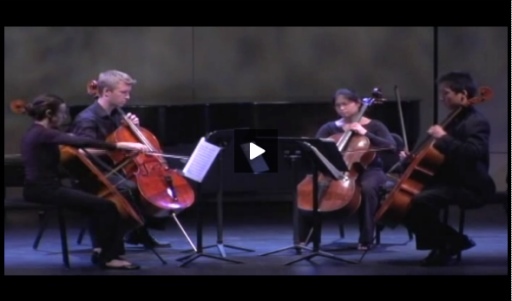 In this work, it seemed like a good idea to have each cellist tell each other stories. Everyone’s story is different and has a different melody and emotion. In the fast parts I admit there is a bit of resonance with the 6th Brandenburg Concerto, but hey, why not? Previous post: V I V I V I V IVIVIVIVI V I!